The two reports contain analysis on women’s leadership and explore the drivers of women’s empowerment more broadly. 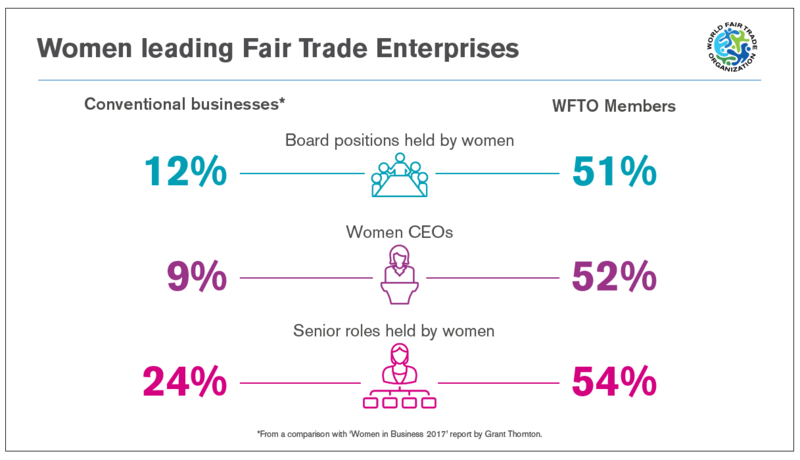 According to separate WFTO research about their members, verified Fair Trade Enterprises support nearly one million livelihoods, 74 per cent of whom are women. “In my organisation ‘CORR-THE JUTE WORKS’ we work with 7000+ women artisans. Through Fair Trade they are empowered. They take part in the highest forum of decision making – that’s our board. They take part in the decision making at their workplace and at home. They have secured their place in the society. That’s empowerment. That’s balance for better future”. The World Fair Trade Organization is the global community of Fair Trade Enterprises. Founded in 1989, it has over 400 members across 70 countries. The membership includes over 330 Fair Trade Enterprises, as well as the broader movement of 70 organisations and networks that support them. The WFTO verifies the commitment of its members to Fair Trade through peer reviews and independent audits. At its core, the WFTO is the home of Fair Trade Enterprises, which are mission-led businesses that put people and planet first.